Bollywood superstar Salman Khan is known for his large-heartedness and kind nature. The 53-year-old actor invariably finds himself in controversies but is also a proud family man. The ‘Tere Naam’ actor is extremely close to his family members and loves spending time with them. Now, Salman’s sister Arpita Khan is married to Aayush Sharma. The couple has an adorable kid in Ahil and he just turned three. 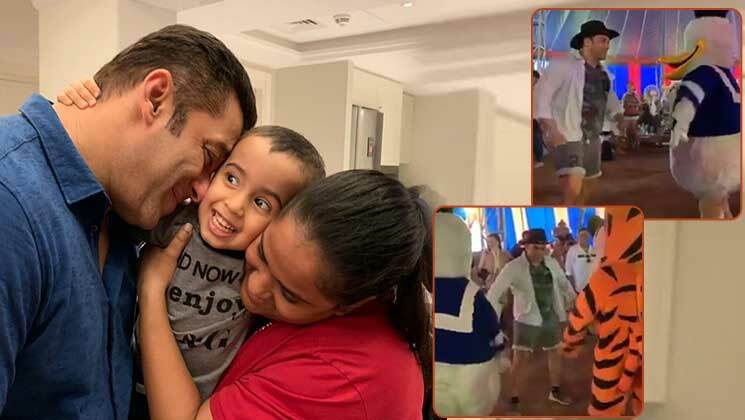 Now, a video has surfaced on social media, where the entire Khan family is celebrating little Ahil’s birthday in a carnival style atmosphere. Salman Khan was in his elements and it was so good to see him having a child like enthusiasm. The Khan household threw an Avengers themed party, Aayush Sharma took up daddy duties and cut the cake for Ahil. Meanwhile Arbaaz khan‘s girlfriend Giorgia Adriani was spotted humming ‘Happy Birthday’ for cute little Ahil. While Salman was snapped much later, Sohail Khan and Arbaaz were part of the grand celebrations for Ahil Sharma. On the work front, Salman Khan will be next seen in Ali Abbas Zafar’s ‘Bharat’. This magnum opus is highly anticipated by the audience. The film also stars Katrina Kaif, Disha Patani, Tabu and Jackie Shroff in lead roles. ‘Bharat’ is slated to hit theatres on the occasion of Eid. The ‘Race 3’ actor will also be reuniting with Sanjay Leela Bhansali in ‘Inshallah’ also featuring Alia Bhatt. Stay tuned to Bollywood Bubble for all the latest news and updates.